Butterhorns displayed on a section of log in Canadian Living. I don’t know about you, but I’m inspired. During the holidays, the food we eat is often as loaded with meaning as it is butter and sugar, which is good news for those of us looking to eat as many cookies and candies as possible in the coming weeks: it’s not over consumption, you see. It’s research. Holiday cooking is part of a web of meaning, tradition, and history, both personal and, as it turns out, national. 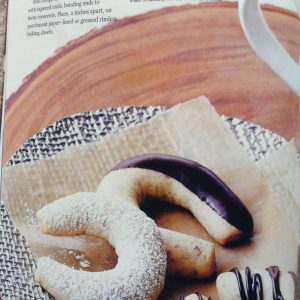 This year, while engaging in my long-standing family tradition of purchasing the Canadian Living Holiday Baking collector’s edition and planning my Christmas baking, I realized that Canada’s Christmas food culture is deeply rooted in our imperial past, with ingredients and processes that tend toward the classically British. In fact, the desserts in Canadian Living would not be wholly unfamiliar to Sir John A Macdonald. The most recent issues of Canadian Living Holiday Baking (a fixture in my childhood home that I’ve maintained) demonstrate this clearly through the promotion of a particular vision of the holidays that is situated firmly in the Victorian era. The connection between Britishness, tradition, and the holidays is especially clear when recent recipe collections from Canada are compared to those from the United States. The recipes in Canadian Living, one of the more popular Canadian holiday baking publications, are decidedly British in flavour and have a nineteenth-century feel in both the simplicity of the ingredients and the way they are presented in the photos; evidently, Canadian culture continues to look to Britain as the source of all things traditional. The recipes in Canadian Living are predominantly twists on classic British foods like shortbread, gingerbread, and trifle, many of which were associated with Christmas in the Victorian era after the holiday was revived after being passé for many years. According to a BBC article on the history of Christmas, “the transformation happened quickly, and came from all sectors of society” and introduced many of the traditions we now regard as integral to the holiday, including roast turkey, Christmas crackers, and the obligation to see family members that one spends the rest of the year actively avoiding. Scholars generally attribute the revival of Christmas to the cult of the Christian family that Queen Victoria perpetuated after her marriage to Prince Albert. While many of the rituals surrounding Christmas are derived from the Victorian era, the Christmas treats seem to be some of the most enduring. In the 2017 Canadian Living holiday edition, there are seven variations on traditional Scottish shortbread, including a fruitcake version that is a definite improvement on the often-reviled Christmas cakes, which many regard as a sad legacy of our imperial past. The old-fashioned English trifle receives a similar update, with rum-soaked gingerbread cake and spiced apple in lieu of ladyfingers, brandy, and fruit. The baked goods in Canadian Living are typically restrained in appearance when compared to their American counterparts. There is very little splashy red and green, and not a hint of Santa or his reindeer. Instead, photographs show the cookies and squares simply displayed against richly painted wood, with the grain visible to really drive home the rustic charm, or on stone cutting boards, white china plates sitting atop woven tea towels, and in one case, placed on parchment paper set on a cross-section of a tree. I expect my lack of rustic serving wear is the reason my cookies usually only bear only a passing resemblance to those in Canadian Living. As much colouring as cookie! Thumbprint cookies rolled in sprinkles and filled with dyed white candy coating from Taste of Home. The cookies themselves also lack the same colourful flair as their American counterparts; the emphasis is on natural ingredients and subtle, rustic decoration rather than the processed vulgarity of American publications. No gaudy red and green sprinkles or unnatural dyed white chocolate fillings are found in Canadian Living —instead, powdered sugar, chopped nuts, candied fruit, jelly, and chocolate drizzle do double duty as flavouring and decoration. The use of pre-packaged foods is also common in Holiday Cookies and Candies, with kitschy treats like Holiday Reindeer Cookies are made from chocolate coated nutter butters cookies and Snowman treats made from butter crackers covered in white candy coating—which, it turns out, is a vile sounding combination of sugar, milk ingredients, and vegetable or palm oil—that are virtually absent from the pages of Canadian Living. Even the use of coloured icing, which is limited, is different. Canadian Living almost exclusively calls for paste colouring. Unlike liquid food colour, paste or gel colours have an oil or corn syrup base, and produce superior results in terms of colour distribution and won’t ruin the consistency of the chocolate, batter or icing the way a liquid can. It turns out they’re also much more difficult to source and use—they weren’t available at my grocery store, and my first batch of icing was a sort of lurid Barbie pink instead of the “Christmas Red” that was promised on the label. Evidently, the true meaning of Christmas baking is in the process of recreating traditional treats and not the ease of getting it right the first time. At least that’s what I told myself as a scrubbed the pink stains from my countertop. 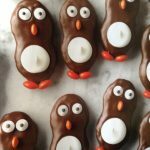 These Penguin Cookies from Taste of Home are actually Nutter Butter cookies covered in chocolate and decorated with candies. No baking is required. If Canadian Living is any indication, Canadians also seem to prefer natural ingredients. American publications tend to feature recipes that are more convenient, and incorporate pre-packaged candies and cookies like Nutter Butters, Candy Corn, Marshmallow Fluff, and Hershey’s Kisses for ease of production. 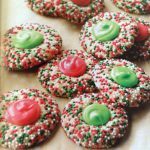 The Canadian Living test kitchen would not approve—there is not a hint of the processed or packaged in their recipes, with the exception of the crushed peppermint candy used as decoration in a handful of cookies. Artificial flavourings are also used liberally in holiday issues of Taste of Home. Artificial peppermint, lemon, rum, and butter flavourings are used liberally, while Canadian Living prefers spices, herbs, and chopped nuts as flavouring, and when orange and peppermint extracts are used, “natural” or “pure” versions that are derived from orange peel and peppermint oil are called for. One reason for this distinction is almost certainly related to Canada’s size and regionalism—ingredients like lemon peel, cinnamon and chocolate are relatively easy to source almost anywhere in the country, whereas there is no guarantee that a manufactured food product will be available everywhere. The world’s most labour intensive (and luscious looking) pie as pictured in Canadian Living. Apparently, Canadians also have more time to spend in the kitchen. 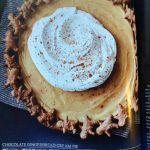 Many of the desserts in Canadian Living are incredibly labour intensive and require multiple steps and several hours to make—I expect that because it’s too cold to go outside, the expectation is that we have 6 ½ hours to spend making chocolate gingerbread cream pie. In those hours, one is expected to make gingerbread pastry from scratch, use half to line the pie plate, and cut out little gingerbread men from the rest in order to decorate the rim, and then make a molasses custard from scratch—I suspect I would probably need two or five tries, which means this would take me closer to 36 ½ hours to produce. It occurs to me that this recipe is particularly rooted in Canada’s Victorian past, as it is best made with the help of several domestic servants and a cook. Of course, not all Canadians participate in the Victorian-inspired, British derived vision of Christmas—of those who observe the holiday, plenty will have their own traditions and holiday foods, many of which may be derived from traditional family recipes that originated elsewhere in the world. Regional variations also certainly exist, however, the persistence and promotion of middle-class white Anglo-Saxon food culture in popular publications does suggest that Canada still hasn’t shed its [culinary] imperial past. Canadian Living is a home lifestyle magazine not unlike Chatelaine that was first published in 1970. They publish annual holiday baking issues that are available at grocery stores. Hilarious! I have fetched up in the US this holiday season, and even in wealthy, hip Marin County, the Christmas decorations are over the top… unselfconsciously lurid and ostentatious. May we ever continue, as proud(ish) Canadians, to congratulate ourselves on our understated good taste and the discrete charm of our bourgeois anti-Americanism, a tradition as old as ‘traditional’ (Victorian) Christmas itself! Lovely piece 🙂 Makes me proud of being Canadian and hungry at the same time! thanks for the Xmas cheer! Great article Cayley. I do love our Canadian cookies! So accurate! Growing up with British parents and grandparents Christmas desserts were full of butter and devine smelling spices and fruit peel. Great grandpa Allan served his homemade shortbread with a wee dram of sherry. Fruitcakes, both light (my favourite) and dark were made in October and mellowed till Christmas Day in their respective cheesecloths. As for plum pudding – hard sauce or lemon sauce – choice was yours. Homemade mincemeat (without the beef suet but with all the spices, fruit and alcohol) – who needs pastry? One year I ate it straight out of the jar! Excuse me while I go help myself to a plain but rich piece of shortbread. Astute comments and subtle (Canadian-style) humour much appreciated. Loved that someone -else besides me spends hours looking at Christmas recipes but can take 6 1/2 hours to prepare something new with multiple trys. Blessed little retro mini-quiches were my downfall this season! Thanks for sharing!